This past weekend saw the last Chicago Symphony Orchestra concerts (including the annual Gala Benefit) to be conducted by Maestro Riccardo Muti until November, and they should not go without notice for several reasons. First, there were the intriguing performances of piano concertos by both Beethoven and Mozart that featured the French pianist, David Fray. Then there was a vivid performance of Paul Hindemith’s symphony “Mathis der Maler.” And finally, there were repeat performances of four of Brahms’ 21 gorgeous “Hungarian Dances” that served as a reminder of the subtle shifts that can occur from one day to the next when you are listening to a live, rather than recorded performance. 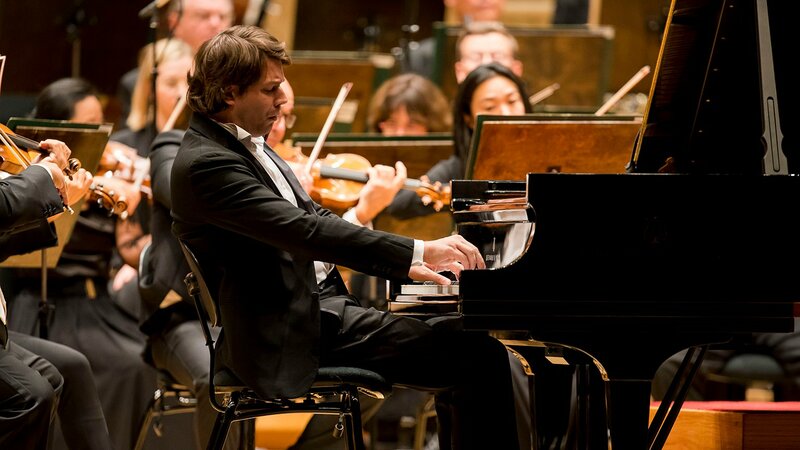 Fray (who just happens to be Muti’s son-in-law), brought an intensely fluid, exquisitely rippling approach to both of these very different works – Beethoven’s Piano Concerto No. 3 and Mozart’s Piano Concerto No. 24. The effect in each was to make you lean in and listen more closely than usual – fully aware of the technical finesse of his playing, but more drawn by the sense that he was listening so closely to the orchestra that he almost appeared to be penning his own response to it on the spot, as if he were the composer. Some might prefer a stormier, more percussive approach to Beethoven (the concerto opens with a sense of gravitas and strength before ceding to lyrical strings). But Fray suggested something different – making the work’s solo passages feel almost like the inner monologues of the composer that periodically interrupt and respond to the larger orchestral framework. There was a singing tone and dreamy liquid motion to Fray’s playing that created separate but complementary waves of sound. There also was a certain madness to the way he teased out the rhythms of the piece rather than attacking them. And the interplay between the orchestra – with the muted plucking of the strings, the gorgeous duet for flute and bassoon, and the glorious horns – was seamless. The Mozart concerto (which Beethoven is known to have admired), was an ideal fit for Fray, and again, Muti and the orchestra – with especially beautiful work by the winds – were in perfect synchrony with him on the Gala evening. And there was the same rippling fluidity and meticulous articulation in his playing of this piece – a work of pure poetry that is a vivid reminder of Mozart’s genius for making music that can feel like a sublime extension of speech, even when no singer is involved. On the same program as the Beethoven was a vivid performance of German composer Paul Hindemith’s symphony “Mathis der Maler” (“Matthias the Painter,” which was inspired by the 15th century German Renaissance painter, Matthias Grunewald and his elaborate altarpiece, as well as by the tension among politics, religion and art in the lives of both men). And while it helps to know the context of the piece, Hindemith “painted” such a complex, dynamically exciting score that it easily stands on its own. Premiered in 1934, just as Hitler was gaining power, the piece suggests Christ’s struggle in a work that can be alternately dissonant and lyrical, ethereal and explosive, mysterious, anguished, agitated and at moments strangely calm. (You might even hear hints of Aaron Copland, Hindemith’s contemporary.) And the composer’s dramatic use of all the colors of the orchestra is masterful – as were the CSO musicians – from the opening horns, and flutes and piccolo, to the powerful contributions of the percussion section, including everything from timpani and drums to glockenspiel and triangle. And then there was Brahms, with his wildly dancing soul, lavish melodies and unmatched flair for expanding upon the rhythmic brilliance of folk music. His “Hungarian Dances” are irresistible, but I prefer them played as close to their roots as possible, and so they were at Thursday night’s performance, when they burst forth with such speed and fullness that you could almost visualize the circling formations and rapid-fire footwork of dancers. When performed again on Saturday night they sounded a bit too tame and “symphonic” for my taste, as did the familiar waltzes of Josef Strauss and Johann Strauss, Jr.
Thursday’s concert opened with a formidable rendering of Beethoven’s Overture to “Egmont,” with its strong but mournful opening, its splendid use of the winds, and its urgent, spiraling momentum at play throughout. CSO Trumpets and Low Brass acknowledge the audience’s applause following their performance of Hindemith’s “Mathis der Maler” Symphony with Zell Music Director Riccardo Muti and the CSO. And now a few last notes in the wake of the CSO Gala which raised $1.3 million. Maestro Muti soon will be heading to Tokyo where, on Oct. 23, he will be presented with the Japan Art Association’s prestigious Praemium Imperiale award, often dubbed “the Nobel Prize for the Arts.” In addition to Muti, the 2018 award winners include actress Catherine Deneuve, architect Christian de Portzamparc, painter Pierre Alechinsky and “fog sculptor” Fujiko Nakaya. He will return to Chicago next month (Nov. 8, 9 and 10), to lead the CSO in Verdi’s monumental “Requiem” – the work for which he and the orchestra and chorus won two Grammy Awards in 2010 for their CSO Resound recording. And there is this: If you have yet to discover Daniil Trifonov, the thrilling 27-year-old Russian pianist, mark your calendar for Oct. 18 and 20 at 8 p.m. or Oct. 19 at 1:30 p.m. when he will perform Prokofiev’s Piano Concerto No. 3 with the CSO. Also on the program, which will be conducted by Marin Alsop (and is part of this season’s homage to the 100th anniversary of the World War I Armistice), will be the world premiere of French composer Bruno Mantovani’s “Threnos” (the title suggests a lyrical lament for a tragic victim), and Copland’s 1946 “Symphony No. 3,” which incorporates the theme of his iconic “Fanfare for the Common Man,” originally written to mark this country’s entry into World War II.